Bremerton is the largest city in Kitsap County with a population just under 40,000 residents. It is located in the center of the Kitsap Peninsula in Washington state. The city is bordered by the Dyes and Sinclair Inlets in the Puget Sound and extends across a narrow strait of water connected by the Port Washington Narrows Bridge. It is just a 17 mile (about 1 hour) ferry ride to Seattle. The city of Bremerton is well known as the home of Naval Base Bremerton and the Puget Sound Naval Shipyard, now a part of Naval Base Kitsap. It is proud of its involvement with Naval history and has many statues, memorials, and museums to prove it. 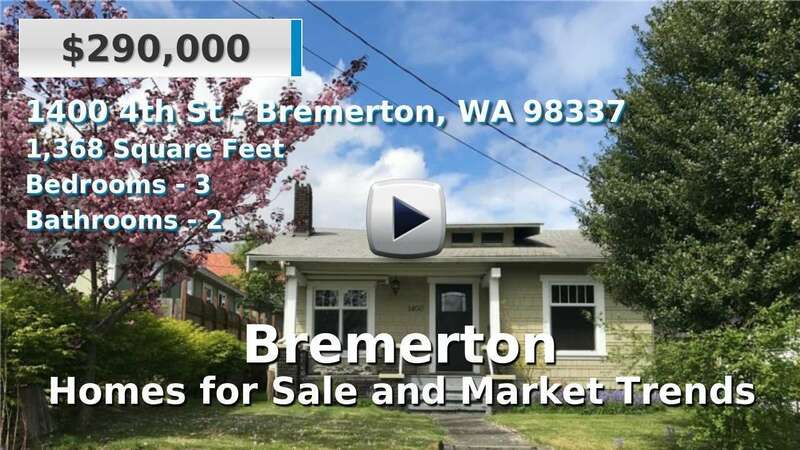 Due to its size and location, homes for sale in Bremerton span every possible style and setting, though the area leans more toward rural than urban. 3 Beds | 2 Baths | 1748 sq. Ft.
3 Beds | 1.5 Baths | 1260 sq. Ft.
3 Beds | 2.5 Baths | 1610 sq. Ft.
2 Beds | 1 Baths | 740 sq. Ft.
3 Beds | 2 Baths | 1860 sq. Ft.
3 Beds | 2.75 Baths | 1478 sq. Ft.
3 Beds | 1.75 Baths | 1246 sq. Ft.
3 Beds | 1 Baths | 1308 sq. Ft.
3 Beds | 1.75 Baths | 1920 sq. Ft.
4 Beds | 3 Baths | 2527 sq. Ft.
4 Beds | 3 Baths | 2387 sq. Ft.
4 Beds | 2.5 Baths | 2144 sq. Ft.
3 Beds | 1.75 Baths | 1330 sq. Ft.
Level lot at end of street. Possible multi-family building site. Close to Perry Ave Mall, bus line, schools and shopping.